The Elise collection includes a few 'hidden' features that make life 'that' much more stylish or easy. Of course, there are storage bed options for extra space in your bedroom. Plus, the nightstand and bachelor's chest options feature built-in charging for electronics and a nightlight! Whisper close drawers throughout the collection make life a little bit easier! The Luccia Bureau even includes a drop down drawer front for housing DVD players and other television components. Whether you choose the upholstered headboard or panel headboard, storage footboard or low profile footboard, night stand or bachelor's chest, dresser or bureau, the Elise Collection will always provide a stylish look for your bedroom. 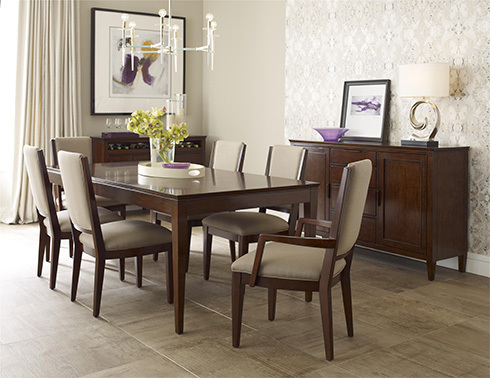 The Elise Collection offers two options when it comes to furnishing your dining room! Choose from a regular height dining set or a trendy counter height dining table and stools. Did we mention there's two storage options too? Store your serving pieces in the Maris Buffet and complete your room with the Wine Server! 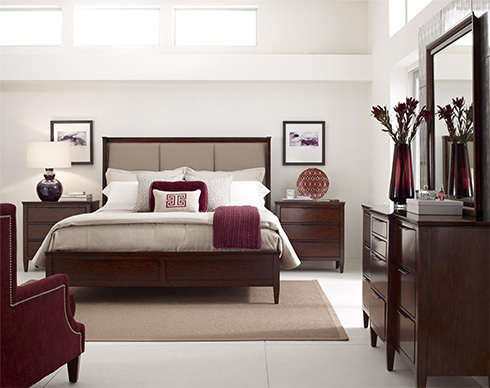 Keep fashion at the forefront throughout your home with the Elise Collection. Made of Appalachian maple, this collection is built tough and will last a lifetime. Find this collection and other solid wood furniture at Belfort Furniture in Dulles, Virginia - or shop online at www.BelfortFurniture.com.